The Product Maintenance Policy describes how Alaska Software handles version life cycles and delivery of maintenance services during the life cycle of a version. This maintenance policy is applied to products licensed by Alaska Software that run under platforms supported and maintained by Alaska Software. Alaska Software delivers a various set of maintenance services such as Major/Minor Product-Releases, Service-Levels, Hotfix-Rollups and Hotfixes. Some of these services are available free of charge to all registered customers, others require a valid and running Subscription contract in place. A Hotfix encompasses any correction to resolve a single PDR or Software Failure for a customer created by Alaska Software. Hotfixes are designed to affect only a single component. Hotfixes are released on a "as needed" basis only, and will not automatically be distributed to registered customers until they are rolled up into a Hotfix-Rollup, Service-Level or Minor/Major Product-Release. A Hotfix component can be identified using the shell-explorer version property-tab. 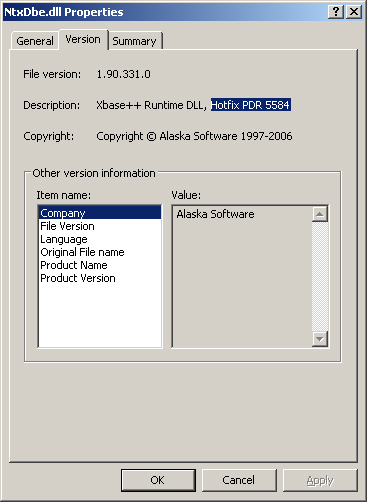 The picture shows the shell explorer property tab of the NTXDBE.DLL indicating that it is a component of HotFix PDR 109-5584 of Xbase++ 1.90.331. Rollups are released upon demand and/or periodically. A Hotfix-Rollup is designed to affect a single component only, but it may address more than one PDR. Hotfix-Rollups are available to any active Subscription customer. Different Hotfix-Rollups release, affecting the same component, are cumulative. Components of a Hotfix-Rollup never change their external interfaces, hence different Hotfix- Rollups can be combined upon specific customer demand. Providing the optimum balance between PDR resolution and leaving a running-system untouched is achieved with this approach. Each Rollup can be identified by its unique number plus the Major/Minor version the Rollup is released for. 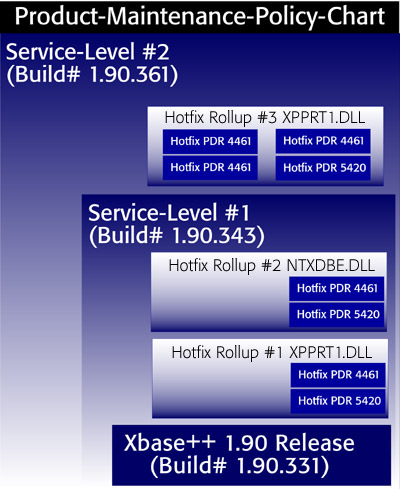 For example Hotfix Rollup #3 for Xbase++ 1.90.331 is called the third Rollup made available for Xbase++ 1.90.331. Important: Hotfix-Rollups are a collection of Hotfixes. By nature a Hotfix will have passed a limited set of validation and Q&A procedures. Therefore it is highly recommended to only install a Hotfix-Rollup if your solution is affected by one of the PDRs resolved by this Rollup. In other words, Customers should avoid installing hotfixes without concrete demand. A Service-Level is a collection of Hotfixes. It may contain new features and/or revised documentation. A Service-Level has undergone our standard validation and Q&A procedures applied to release-products, too. Service-Levels are provided to any customers in form of an installation package, which will patch an installed version of the product. Service-Levels are made available upon the sole discretion of Alaska Software taking various parameters into account, such as cost-benefit-analysis and customer demand. A Service-Level is available to all registered customers of the product. The same build-number is assigned to all components of a Service-Level. Service-Levels have the same minor/major revision number as the product for which they are released. Full interoperability with existing TechnologyPartner Add-On products is guaranteed, unless stated otherwise. It is recommended to all customers to install Service-Levels as a part of their own proactive maintenance plan. As vendor, Alaska Software has to balance the severity of incidents and/or requests of individual customers with the commercial reasonable effort for resolving issues and other demands. This maintenance-policy is a tool allowing us to react as quickly as possible to critical customer incidents (Hotfix), provide a in-time and continous flow of vital fixes to eligible customers (Hotfix-Rollup) and maintain a consistent product-version-level available to all customers (Service-Level). The illustration shows how each maintenance effort from Alaska Software wraps into another one leading to a streamlined and effective maintenance policy. This way providing transparency to customers and providing choices needed to manage reliability and quality of end-user solutions. Build-Number: The Build# uniquely identifies a snapshot of the code-base of a product. The Build# of Xbase++ 1.90 release-level is 331 and is the last number of the Full-Version-ID 1.90.331. De-Supported: No Technical Support is granted for De-Supported Product versions. Technical Support may open cases, but is not able to assist customers with issues that are specific to the de-supported version. Major/Minor Product-Release: A Product-Release is identified by a increase/increment of Major or Minor Version number. For example, Xbase++ 1.90 has a major Version# 1 and a minor Version# 90. Passive-Supported: Product-Releases move from Active-Supported to Passive-Supported at the first date on which the version is no longer available for sale or at which date a newer version is shipped. Passive-Supported products receive Technical Support, however NO Hotfixes, Rollups or Service-Levels are released for Passive-Supported products. To receive a correction for PDRs the customer must update to the Active-Supported version. TechnologyPartner: Typically these are vendors developing, selling or maintaining a technology or product which helps to increase the productivity of users of Alaska Software products. Products from TechnologyPartners are part of the standard validation and Q&A process of each new product release or service-level.